Do you want to visit a place steeped in history that very few have seen? If the answer is yes, then please do consider visiting the town of Rajmahal in Jharkhand. Among the least known capitals of India, unbelievably Rajmahal was once the erstwhile capital of a large area covering Bihar, Bengal and Orissa. Located in beautifully green surroundings, by the shores of the River Ganges, it is rich in monuments and ancient sites. Rajmahal, being off the beaten track, has now been reduced to a small town in the Sahibgunj district of Jharkhand, but has a number of hidden treasures that deserve to be seen. There are many exciting stories linked to Rajmahal — it was the site of a historic decisive battle governed and won by Emperor Akbar’s General Raja Man Singh and Prince Shah Shuja, the son of Shah Jahan, who lived in Rajmahal for a few years till the Mughal army was defeated in battle by the Marathas. It was not long before they were also vanquished by the British army and for many years thereafter peace reigned in Rajmahal. Located along the western banks of the Ganges this area was earlier known as Ag Mahal (or Advance Palace) a location where tents were pitched by the armies of Bengal Sultans before going to battle. The name was changed to Rajmahal in the 16th century, by Raja Man Singh, after the defeat of the Maratha army. Rajmahal was then considered important enough to be visited by senior British officials, among whom were Lord and Lady Hastings, who enjoyed boat rides and the splendid view of the river and the dolphins who appeared on the surface from time to time. The best view was from the Sangi Dalan — a marble pavilion facing the river. The Sangi Dalan, which offers the most spectacular view of the Ganges, continues to be the most important structure in Rajmahal — and the only well maintained part of Shah Shuja’s palace complex. In the palace ruins we can still see three large rooms that are open on all sides, which give us an idea of the past grandeur of the palace. The central chamber is the most interesting and has black marble arches that are supported on 12-sided pillars and covered with a vaulted roof. Adjacent to the Sangi Dalan, is the Rajmahal police station built on top of a large hall, which has a very interesting history. It is said that mounted horsemen hid in this hall and when given a signal, would race through its arched halls and rooms to descend as if by magic, on their unwary enemies. Close to the Sangi Dalan, one can see a large well earlier used by the railways for pumping water for their engines. It has also been said that when Shah Shuja was defeated by Aurangzeb's Army in 1660, the ladies of the harem threw all their jewellery into the well. Also quite close to the Sangi Dalan is the Akbari Mosque, built in 1556. Windows are said to have been added later to the mosque’s Mihrabs, to create a British dispensary inside the mosque. The dispensary operated till 1912, after which the mosque was restored to its original architectural shape. The road from Rajmahal through Bhagalpur and Sahibgunj, runs westward from the Akbari mosque and offers many interesting places worth seeing. Kanhaiyasthan, is an ancient building where it is said that every night, Radha and Krishna used to dance here. The imprint of their footsteps and those of Chaitanya Mahaprabhu who visited the site later, can be seen on the floor. Needless to say one should take many of the tales told with a big pinch of salt! Almost six kilometres from Sangi Dalan, is the Jami Masjid, a century old structure built by Raja Man Singh that combines Colonial and Bengali architectural styles. The mosque has a large prayer hall and a spacious compound and wall, with an entrance gate on the eastern side, while beyond the western wall of the mosque is a small temple and a well. 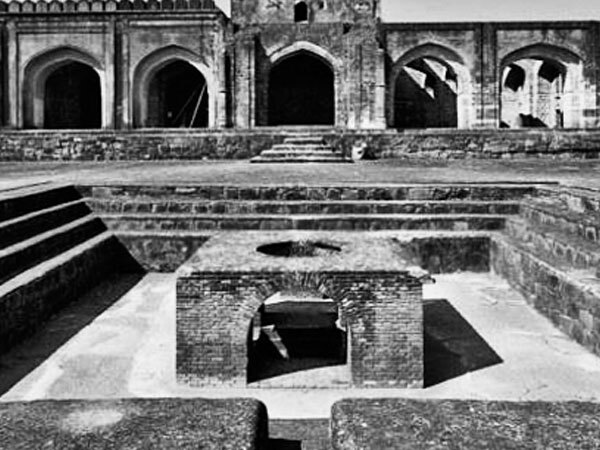 Half a kilometre away is a hammam, said to have been part of Raja Man Singh’s Palace. A roadside grave is said to be that of Miran, the son of the erstwhile Nawab of Bengal, Mir Jaffar. Its simplicity is unusual in that era of large elaborate tombs and mausoleums. Maina Bibi’s grave in the centre of the town has a far more elaborate tomb, dating back to 1779. One of the earliest mosques in the region, the Jumma Masjid is located nearby. Another important tomb is a few kilometres away in Begampur. In need of restoration like so many of the other structures in the area, this 17th century tomb is said to be the first octagonal tomb in Bengal. Also worth seeing in Begumpur, is the Sirsi mosque and Shah Shuja’s pleasure retreat. Tavernier and Bernier who visited Rajmahal in 1666, are said to have called Rajmahal a ‘commercial city’ and interestingly there are still signs of the type of commerce that was carried on in the region. These are the remains of ice-making tools dating back to Mughal times. It has been said that ice was prepared and effectively preserved to ensure a year-long supply. In fact it has been recorded that the Nawabs of Bengal received their supply of ice and mangoes from Rajmahal regularly till the 1720s and that it was the job of a government officer specially posted there, to ensure that the Nawabs received their supplies in time. During colonial times, Rajmahal, located on the banks of the Ganges, had also in a small way, became part of the British programme for an indigo cultivation. Those indigo fields are probably being used for growing rice, dals, other cereals and even mustard.